Many food items wind up in the garbage even though they are still edible. A compact food scanner will help avoid unnecessary food waste in the future. 07-Jan-2019: According to a study by the environmental organization WWF Germany, ten million metric tons of food are thrown in the garbage every year in Germany despite still being edible. A mobile food scanner will allow consumers and supermarket operators in the future to test whether food items have gone bad. The pocket-size device uses infrared measurements to determine the ripeness and shelf life of produce and display the results via an app. Fraunhofer researchers developed the system, which exists in demonstrator form, together with partners in a project commissioned by the Bavarian Ministry of Food, Agriculture and Forestry. Is this yoghurt still good? Are those vegetables still edible? When there is doubt, people tend to chuck food into the garbage. Many products are thrown out simply because they no longer look appetizing or have superficial blemishes, or because they are past their best-before date. In Bavaria alone, 1.3 million tons of food wind up in the garbage unnecessarily every year. Through the “We Rescue Food” alliance, the Bavarian Ministry of Food, Agriculture and Forestry wants to combat waste by means of 17 initiatives. One of the projects concerns a food scanner designed to help reduce waste at the end of the value chain – in stores and in the homes of consumers. 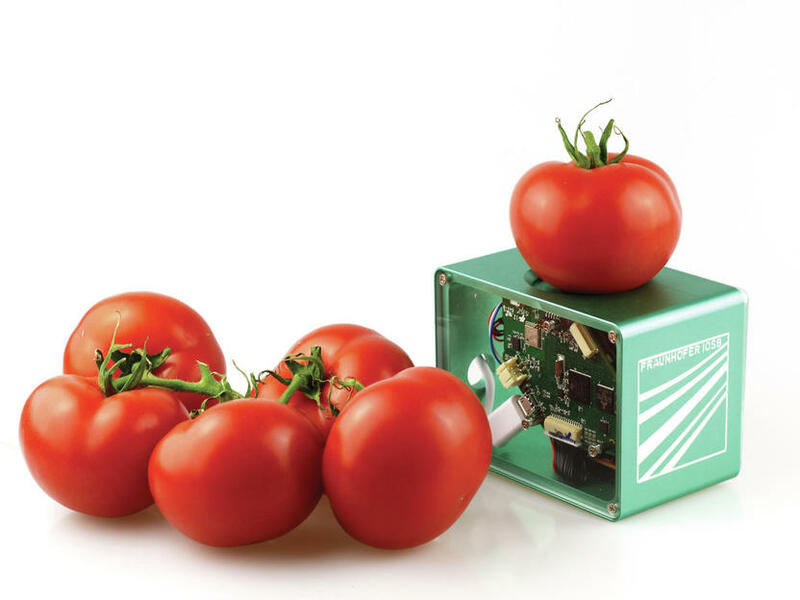 In future, the inexpensive pocket-size device will determine the actual freshness of food, whether packaged or unpackaged. Researchers at the Fraunhofer Institute for Optronics, System Technologies and Image Exploitation IOSB, the Fraunhofer Institute for Process Engineering and Packaging IVV, the Deggendorf Institute of Technology and the Weihenstephan-Triesdorf University of Applied Sciences are developing the compact food scanner, which has been built as a demonstrator with data for two foodstuffs and also permits the shelf life of products to be estimated. laboratory, we’ve long been able to quantify individual components using near-infrared spectroscopy. What’s new is that this can now be done with small, low-cost sensors,” adds Julius Krause, a member of Gruna’s team. “Foodstuffs are often counterfeited – for example, salmon trout is sold as salmon. Once suitably trained, our device can determine the authenticity of a product. It can also identify whether products such as olive oil have been adulterated,” says the physicist. But there are limits to the system, too: It can only evaluate the product quality of homogeneous foods. At present, it struggles to inspect heterogeneous products containing different ingredients such as pizza. To this end, the scientists are investigating high-spatial-resolution technologies such as hyperspectral imaging and fusion-based approaches using color images and spectral sensors. To be able to determine the quality of food based on the sensor data and the measured infrared spectra and compute the shelf life predictions, the research teams are developing intelligent algorithms that search for telling patterns and regularities in the data. “Through machine learning, we can increase the recognition potential. In our tests, we studied tomatoes and ground beef,” says Gruna. For example, we used statistical techniques to correlate the measured NIR spectra of ground beef with the rate of microbial spoilage and derived the remaining shelf life of the meat from the results. Extensive storage tests, whereby the research teams measured microbiological quality and other chemical parameters under various storage conditions, showed good correlation between the computed and actual total germ counts. The scanner sends the measured data via Bluetooth to a database for analysis. This database is a specially developed cloud solution in which the evaluation methods are stored. Next, the test results are transmitted to an app that displays them to the user and shows how long the food item will remain fresh under different storage conditions, or indicates that its shelf life has already expired. In addition, the consumer is given tips on alternative ways of using food that is past its best-before date. A test phase is due to begin in supermarkets at the start of 2019, which will investigate how consumers respond to the device. More broadly, it is expected that the versatile technology will be used throughout the value chain, from raw material to end products. Its ability to detect changes in quality at an early stage facilitates alternative uses and helps reduce waste, but the scanner is more than just an instrument for testing food items. It might be better described as a general-use, cost-effective scanning technology that can be easily adapted. For example, the system could be used to sort, separate and classify plastics, wood, textiles and minerals. “The range of potential applications is very wide; the device just needs to be trained accordingly,” says Gruna.